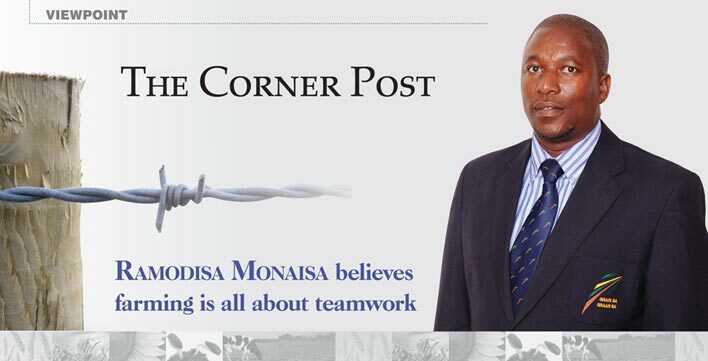 Ramodisa Monaisa, a farmer from the North West Province, believes that a good farmer has to be a team player. This is why he is so involved in the organisational structures of agriculture. He has been a member of Grain SA for ten years and recommends the programmes and projects presented by this organisation. “I joined Grain SA hoping to gain more knowledge on how to grow crops successfully,” he mentions and adds that he has seen a big difference in his harvest due to their programmes and information days. He not only serves on the Grain SA executive committee, but is the vicechairperson of the Farmer Development working group and represents Grain SA and developing farmers as a member of the OPOD Trust. During 2014 he was one of 20 farmers who attended the Grain Academy, a partnership between the University of the Free State, Syngenta and Grain SA. As this programme dealt with the challenges emerging farmers face, it has also played a role in his development into the commercial farmer he dreams of being. He knows that the input and advice from this academic programme, experienced producers and organisations like Grain SA will ultimately help him realise this dream. This father of three, who is married to Mmbakwena, is the fourth generation farmer on Gelukspan Farm in the Mafikeng area. His great grandfather was a farm worker and purchased the ground in 1923. His grandfather and father never considered other work opportunities as farming was in their blood. Ramodisa, who learned the trade of auto body repairs and welding at school, first tried his hand at repairing wheelchairs at a nearby hospital where he also worked as a driver. Within six months he realised that he was a farmer at heart. “I inherited the love of farming. As a young boy I was a shepherd after school and learned to drive from a young age. When I started driving a tractor, I really began to enjoy farm life,” he shares his childhood farm memories. He believes that this is the best way for parents to get their children interested in farming. Involve them from a young age and let them experience all aspects of the farm – from the hard work in the field to the financial side. Ramodisa is mainly a crop farmer and plants maize, sunflower and groundnuts on about 150 hectares of land. He is the proud owner of more than 100 sheep which graze on another 100 hectares of Gelukspan Farm. “The best thing about farming is when you can see that your planning and hard work is successful. It is wonderful to make a difference in the country by contributing to food security,” he adds. Dream big: See yourself as a commercial farmer with all the equipment producing food for all South Africans. He encourages developing farmers not to think about money, but to work hard and to concentrate on producing a quality crop. “Make sure you are doing the right thing when you plant and when you plough. Take care of your crop and make sure you deal with the weeds. Money must be the last thing on your mind,” he advices emerging farmers. This passionate farmer feels strongly about politics in agriculture. He explains: “Agriculture is agriculture, there is no colour involved. The people planting the seed may be different, but the seed is always the same colour.” To him these two areas cannot blend. “The two can’t mix,” he says and adds with a smile, “Farmers have to work. There is little talking and lots of working. In politics there is a lot of talking and little working.” He would however like to see the country’s agricultural industry growing to the level of Argentina and America where government is involved in growing and uplifting the industry.